Indonesia is one of four countries in the ASEAN Peatland Forests Project - APFP. The Indonesian peat land and swamp is estimated about 13 million hectares. 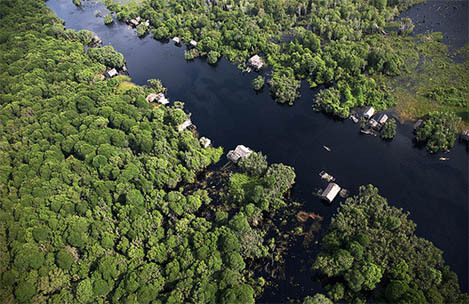 With these areas Indonesia has the largest tropical peat swamp in the world. Based on research, the Indonesian peat land has the largest biodiversity in the world, which covers the peat deposit. Peat swamp has very important function in the area's water system, biodiversity and as an important carbon saver. Peat swamp, besides being the habitat of several endangered species such as Sumatran Tiger, Orang Utan and Sinyulong Crocodile, it is also the source of life for local inhabitants. Especially some species of valuable wood help to improve locals' economic situation. At the moment, illegal logging, drying up and land conversion are the main issues of peat swamp degradation in Indonesia. These activities hav triggered major fire disasters almost each year since the El-Nino in 1997. In the period of 1990 to 2002, only in Sumatra, it is estimated that 3.47 billion tons of carbon has been lost due to fires and human activities modifying the peat land. Peatland ready to be restored as functional area.